October 29, 2013 | 7 a.m.
Mary Pawlenty '83, Dan Addington, and Theresa Bademan (left to right) spoke during a panel discussion at the MISSION:WORK conference at Bethel University. Bethel University students across all schools joined pastors, church leaders, and other professionals at the MISSION: WORK conference held at Bethel October 10 and 11. The conference focused on how workers and their pastors can respond to the mission of work, the primary arena of kingdom purpose and discipleship for most adults. 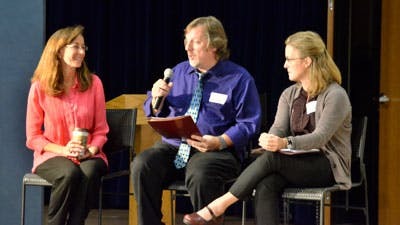 The aim of the conference was to “raise up a vision for the great kingdom value and potential of work—while recognizing the challenges of working in a fallen world,” according to Chris Armstrong, professor of church history, Bethel Seminary, and director, Bethel’s Work with Purpose initiative. Participants attended a practical breakout session from among three choices: “Bible & Theology” with panel participants and Bethel Seminary professors Jeannine Brown S’91, Paul Ferris, and Kyle Roberts; “Workplace” with panel participants Dan Addington, Theresa Bademan, and Mary Pawlenty ’83; and the “Church-based” with panel participants Daniel Harrell, Joel Johnson ’80, S’86, and Amy Sherman. The two-day event also included a Q&A with the plenary speakers, interactive discussions, and video testimonies. Bethel Seminary hosted MISSION:WORK as part of the Work with Purpose initiative, funded by the Kern Family Foundation. Learn more about the Work with Purpose initiative.